Buenos Aires, Argentina. Today at 5pm (Euskal Herria time) Korrika 21, the race in favor of the Basque language and in support of AEK will leave Gares (Puente la Reina). For 10 days, Korrika will tour more than 200 towns to conclude on April 14 in Vitoria-Gasteiz. The Diaspora won’t be left out of this movement, since many clubs are also joining in the campaign. The korrikalaris around the world won’t only join in on kilometers, but also by organizing cultural and recreational activities. News about Korrika 21 will be the priority for Euskaltzales over the coming days. Following are new events in Europe and America, but we will continue to update these. -Berlín, Germany. Gernika Kulturverein Euskal Etxea invites everyone on April 13 at 12:30pm at the Oranienplatz. The route will be 1.2 kilometers from Mahalle Kiezladen, Waldermarstr. There will be food and drink, music, karaoke and a concert by Zea Mays. More information, here. -Buenos Aires, Argentina. The Euskaltegi will hold its first Topaketa of the year on April 5 that will include a celebration of Korrika. The event begins at 8:30pm. -Chascomús, Argentina. The Zingirako Euskaldunak Basque Club invites everyone on April 13. The departure point will be the plaza in front of the clubhouse. -La Plata, Argentina. Basque students from the Euzko Etxea and the Lectureship at the University of La Plata will gather on April 13 at 5pm in the Moreno Plaza for Korrika. Afterwards there will be a snack and dinner at the clubhouse. -Viña del Mar-Valparaíso, Chile. This event is on April 14 at the Flores de Viña del Mar clock at 11:45am. From there Korrika will run to the Euzko Etxea where a manifest will be read. At 2pm there will be Basque activities, music, dance and karaoke. Lunch will be served at 2:15pm. More information here. -Madrid, Spain. 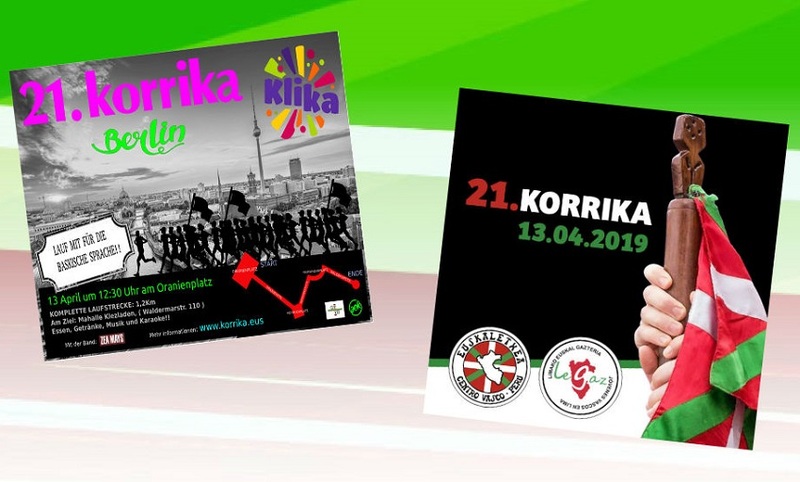 The Madrid Euskal Etxea invites all euskaltzales to Korrika on April 6 at 11:30am. The route will go from Glorieta Bilbao to the Euskal Etxea where there will be an aperitif at noon, along with the Korrika Txiki. At 1:30pm at the Cornisa Park the race will end and a manifest will be read. There will also be a dance workshop at the plaza with the club’s Etxeako Sustrai dancers. At 2:30pm there will be lunch followed at 5:30pm by a concert by Esne Beltza and Esne Beltza and Ezetaerre. More information, here..
-Barcelona, Catalonia The Euskal Etxea in the Catalan capital city invites everyone to its clubhouse on April 6, for the following: at 10:30am Korrika txiki; 11hs, Korrika 21; 13hs, arrival to the Can Batlló; 14:30hs, lunch. Concerts by Aldats, Koban and Gora Etorri. More information, here. -Lima, Peru. The local Basque club invites everyone to participate in Korrika on April 13. The route will go through Miraflores. More information, here. -Carmelo-Montevideo-San José, Uruguay. Invited by FIVU, the Euskaro and Haize Hegoa Basque Clubs in Montevideo will gather on Saturday, April 6 to make an allusive video. Ibai Ondoko in Carmelo and San Joseko Euskaldunak Taldea will hold their own and all material will also be included in the video.